Joe Perry kept the best season of his 24-year career going by beating Zhang Anda 10-4 to reach the last 16 of the Betfred World Championship. Perry fulfilled a lifelong ambition last month when he won his first full ranking title, beating Mark Williams in the final of the Players Championship in Thailand. He has also won an Asian Tour event this term, reached the final of the Wuxi Classic and could be set for a place among the world’s top eight. And the 40-year-old from Chatteris remains a contender for snooker’s biggest prize thanks to a impressive win over China’s Zhang, to set up a match with Shaun Murphy or Robin Hull. Perry, who reached the semi-finals in Sheffield in 2008, did the bulk of the damage this morning when he built an 8-1 lead. Zhang threatened a fight-back tonight when he won the first three frames with a top break of 132. But Perry crucially won the 46-minute 13th frame as a superb pot on the final blue set him up to clear the table, and after the interval he capitalised on a missed yellow from his opponent to seal victory. “I expected him to come back tonight, though it was still a horrible feeling when he did,” said world number nine Perry. “I was prepared to go 8-5 and then I would have had a chat with Terry Griffiths at the interval to calm me down. As it turned out I potted a great blue to go 9-4, one of the best shots I’ve played at the Crucible. “If I play Shaun Murphy next it will be fin, a good open game. If anything he’s more aggressive now than he’s ever been, and he’s better than he was ten years ago, which makes him very dangerous. If I’m honest I’d admit this is the first time I’ve come here believing I can win it. I had always felt that I could beat any opponent, but now I’ve won a big tournament which had every single player in it. Judd Trump moved within three frames of a second round meeting with Marco Fu by taking a 7-2 lead over Stuart Carrington. 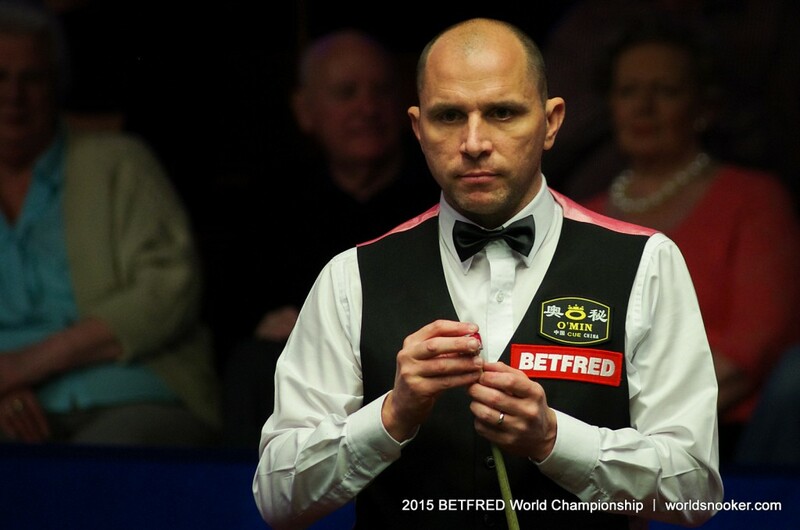 The first two frames were shared before Trump went 4-1 ahead with top breaks of 54, 53 and 60. Crucible debutant Carrington cleared from brown to pink to steal frame six, but Bristol’s Trump finished the session superbly with 85, 62 and 85 to establish a commanding overnight lead. They resume tomorrow at 1pm.